Inside: Brave Writer reviews can be extremely polarized and confusing. As a new homeschool mom searching for a unique language arts curriculum, I read them and walked away bewildered, not knowing what to think. So what turned a former skeptic into a Brave Writer enthusiast? Read my honest Brave Writer review to find out. A few years ago, I decided to step away from the University Model school my daughter attended and brave homeschooling all on my own. As I was researching various curriculums, I focused my attention primarily on math and language arts. All my daughter knew of language arts at that point was a phonics workbook she absolutely despised. I’m talking serious hatred: as in she would sit and stare out the window for 45 minutes instead of doing one page in that workbook. I knew she needed something different, but what? During my search, I came across Brave Writer. The reviews were mixed and extremely confusing. One reviewer sang the program’s praises, while the immediate next one bashed it. Some people called it the best language arts curriculum ever; others criticized it as wishy-washy, unclear and a waste of time and money. As someone with a strong background in language arts mechanics – I could spot a spelling or grammatical error a mile away – I decided against Brave Writer at the time. I didn’t understand it, and it seemed too risky for a new homeschool mom just finding her footing, a homeschool mom who had yet to learn that homeschooling is a lifestyle, not the 9-3, 180 days a year thing that is traditional school. Fast forward a year or so to when I became a writer myself. My entire perspective on writing changed, and that change brought me back to Brave Writer. Growing up, I exceled at school, and language arts was no exception. But even though I received high grades and praises from my English teachers, I hated writing. The most delightful part about graduating college was being DONE with writing. I didn’t expect to ever write a paper or more than an e-mail voluntarily ever again, and I didn’t for years. But then I decided to start a blog. I loved making product recommendations to friends and sharing my experiences with minimalism, homeschooling, life as a mom, saving money, etc. When I heard you could make money doing it, I was ecstatic! We really needed the extra income (as we all know, living on one income isn’t what it used to be), and if I had to write to do it, so be it. My first blog posts were pretty terrible, though I didn’t realize it at the time. I was raised an academic writer, I actually had to unlearn most of the writing rules and formatting I had been taught. I realized that even if I could spell like a champ and churn out grammatically correct sentences by the dozen, those things did NOT necessarily make for good writing. The more I wrote, the more I discovered something that shocked me: I loved writing. Like, triple emoji heart loved it. So why on earth did I believe for much of my life that I hated it? After a LOT of reflection, I finally figured out why. I believed I hated writing because I never wrote about anything I actually cared about. Every single writing assignment over my entire traditional school career was just that: an assignment. Throughout traditional schooling – public or private – the system makes writing a chore, something you have to do. It prioritizes teaching how to write versus helping students figure out what they have to say. And we wonder why kids hate writing, and most stop writing as soon as their education lets them off the hook. After I realized that I actually loved writing about things I’m passionate about, I revisited Brave Writer. I read everything I could get my hands on: reviews, blog posts, and Facebook group comment threads. Once I understood that this language arts program prioritized developing your writer’s voice BEFORE worrying about writing mechanics like grammar and spelling, I knew Brave Writer was for us. Language mechanics can be taught fairly easily. Passion for writing and confidence that you have something valuable to share with the world through writing? Not so easy to teach. One way to see if Brave Writer would be a good fit without a lot of risk is to purchase one of their Arrow Guides (grades 3-6). These guides are inexpensive and provide copywork and dictation passages from a companion read-aloud novel (purchased separately). You can even download free samples of specific guides like this one for Charlotte’s Web! There are several older guides than can be purchased individually. See all the guides that are available HERE. So what exactly is Brave Writer? Like me, many homeschool moms stumble across Brave Writer in their search for a quality language arts program, but have a hard time understanding what exactly Brave Writer is or how to use it. In a nutshell, Brave Writer is a way of teaching writing that mimics how professional writers approach writing, as opposed to how the academic world teaches writing. This unconventional language arts program prioritizes what you have to say, as opposed to the mechanics of actually saying it. That’s not to say that Brave Writer disregards language mechanics or excellent writing – not at all! I think this is the most common misconception about Brave Writer, that it disregards the how of getting your words down on paper. Rather, Julie Bogart, creator of the Brave Writer program, understands that pushing language mechanics and writing too soon will often stomp out your child’s writing voice, pretty effectively killing any natural desire to write. And that can make teaching writing in your homeschool pure torture – for you and for your child. Maybe your child is an achiever, like I was, and can churn out proper sentences on command and go through grammar workbooks from morning ‘til night, but still, at the end of the day, what’s your goal? A child who can write flawless academic papers on demand, or a child who genuinely enjoys communicating her thoughts through writing? 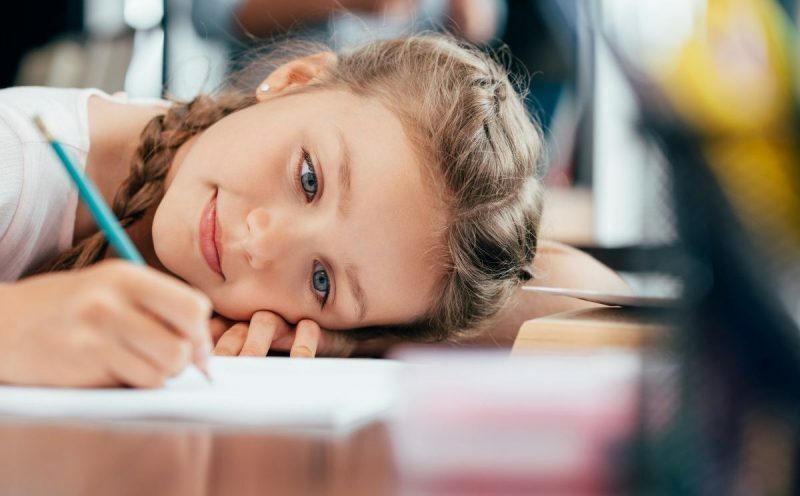 Instead of focusing on the mechanics of writing from an early age, Brave Writer encourages you to focus first on nurturing the writing voice in your child, encouraging her to take risks in her writing. Brave Writer teaches you how to cultivate a home environment that unlocks your child’s inner writing voice. Brave Writer gives you the tools to free your child to figure out what unique thoughts and ideas she has to share with the world. Much of how you start using Brave Writer will depend on how old your children are when you start using it. I don’t have much advice about high school, except that Julie created this resource specifically for high schoolers. If you are starting to use Brave Writer when your kids are fairly young (before middle school), I recommend that you start with the Brave Writer Lifestyle. You can download a free guide on how to do that HERE. Next, head to the Brave Writer podcast and work your way through the episodes. The Brave Writer Youtube channel is equally helpful – sometimes more so. 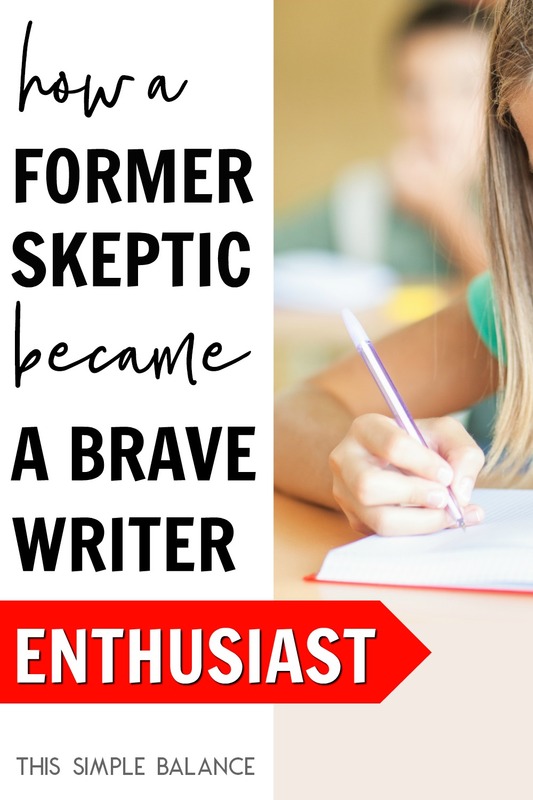 Hearing Julie discuss every aspect of the Brave Writer lifestyle, along with sharing her thoughts on homeschooling in general, will give you a better grasp on how to start using Brave Writer. 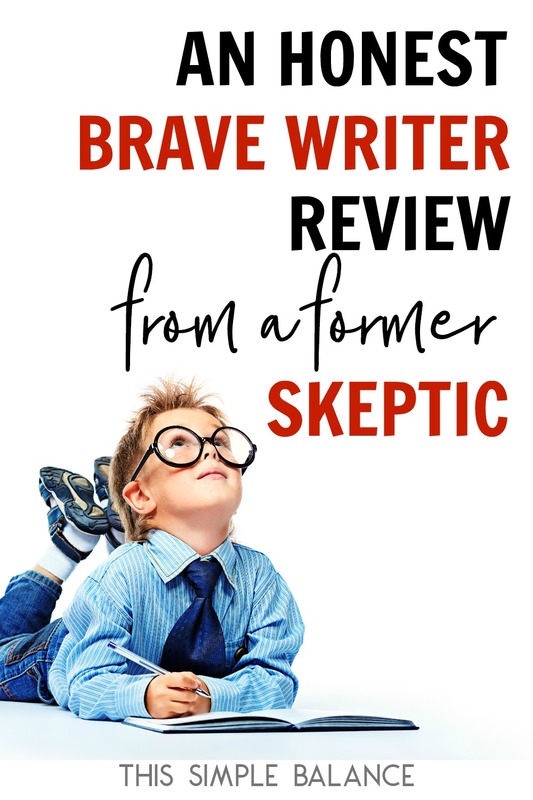 Even if you don’t end up using Brave Writer, Julie Bogart is the one of the most encouraging veteran homeschool moms I’ve come across so far. Having successfully graduated five kids, she offers a wealth of FREE wisdom and encouragement for your homeschool journey through the podcast and Youtube Channel. If you buy nothing else, the Writer’s Jungle is a must if you want to use Brave Writer for the long run, and to get the overall road map and philosophy for helping your child become a good writer. It’s the Brave Writer bread and butter, so to speak. You need to know, however, that the Writer’s Jungle is heavily philosophical and methods-based. You won’t walk away with a checklist or step-by-step outline or a daily schedule for exactly how to take your child from writing letters in first grade to writing college-level papers her senior year. But it will help you understand how the writing process can develop ideally from childhood to adolescence, from a professional writer’s point-of-view. The rest of the products Julie has created support the Writer’s Jungle. They can offer you the more concrete, step-by-step help to implement the philosophy and methods for teaching writing that she details in that the Writer’s Jungle. The best thing I could have done for my daughter, nearly age 9, was to LET GO of trying to “teach writing” the way I was taught. Since I stopped making her write and trying to teach grammar and spelling in a traditional sense, she has truly blossomed. She listens to me read-aloud almost every day, reads physical books to herself and her brothers, listens to audiobooks constantly, and writes for her own projects and purposes on an almost daily basis. I do lend spelling and grammar help as she asks for it. Through all of these things, I have watched her grammar and spelling steadily improve. She writes for the joy of writing: not because she has to write. When she is in fourth or fifth grade, I plan on doing a year of intensive grammar instruction using this program. We will also probably try out Brave Writer Arrow Guides in a year or two. For now, I’m thrilled that she is writing spontaneously. She’ll go a couple of weeks without writing anything more than notes and lists; then one day, inspiration strikes, and she’s off to write a few pages of her latest book. My boys are just starting to learn how to write words, much less entire sentences. Eventually, I will start using some of Brave Writer’s suggestions for the Jot It Down stage. Jot It Down is a writing stage when kids have so many ideas and thoughts, but the process of actually writing those things down is too arduous. You lose so much when you insist on them producing the actual writing. Instead, Brave Writer encourages you to set aside to time to write down (or type out) your child’s stories or responses to different prompts. While my boys may not be actually writing yet, we all love the Brave Writer Lifestyle. Currently, our favorite elements are poetry teatime, playing with language, and big, juicy conversations. My kids look forward to poetry teatime every single week. Not a big poetry fan myself, I reluctantly implemented this part of the lifestyle because everyone else said it was magical. And guess what? It really is. My kids love poetry because of this simple weekly ritual (and of course, they love the treats, too). We love gameschooling, and I use games a few times a week to reinforce and practice both language and math skills. I already mentioned that writing spontaneously and frequently on her own, so I’m not going to mess with that by scheduling freewriting at this point, though I may in the future. Finally, big, juicy conversations happen on a regular basis around here, and I consider them a major part of my kids’ education. While copywork and dictation seem to be hallmark of Brave Writer (if that reminds you of Charlotte Mason, that’s because some of Brave Writer is Charlotte Mason-inspired), I have chosen not to implement it at this point. We will see what the future holds. The beauty of Brave Writer is that you don’t need to implement every recommendation right away, all the time, or even at all. Part of what Brave Writer has taught me is how to trust my homeschool mom instincts, and for that I am so very thankful. If you’re looking for a traditional and systematic language arts program, you probably aren’t going to love Brave Writer. If you want direction and a format for exactly how to teach writing, a tried and true curriculum, Brave Writer might not be the best fit. If you want a scheduled program with daily assignments and everything included in one neat and tidy package, definitely don’t try Brave Writer. You will probably end up writing one of those negative reviews. Do you like the idea of teaching language mechanics using quality literature, as opposed to workbooks? Brave Writer creates easy-to-use products to help you do just that. Do you want to learn how to create a language-rich environment in your home? Brave Writer is for you! 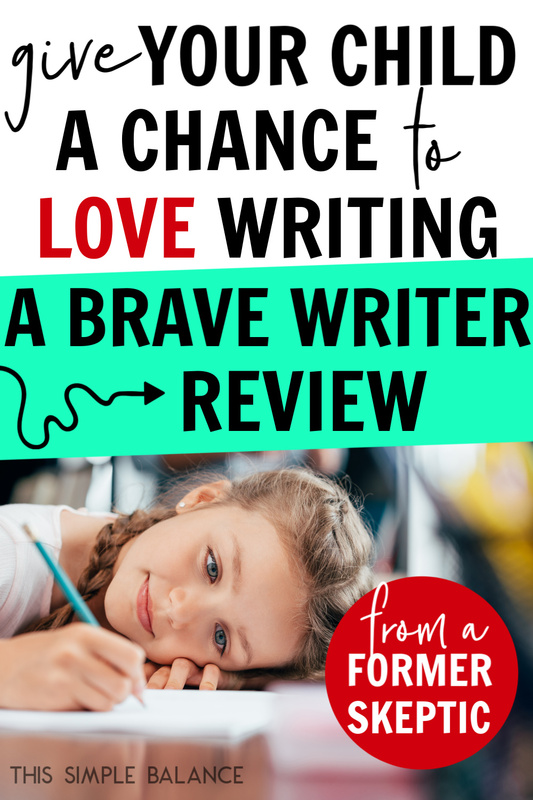 If you would love your child to enjoy writing for life, regardless of whether or not they ever become a professional writer, Brave Writer is an obvious answer (in my humble opinion). Grab the free guide to the Brave Writer Lifestyle, or a few free days from a Gracious Space. You might like what you find. Or better yet, you just might love it. This is one of the best reviews for Brave Writer that I have ever read. I discovered Brave Writer not too long ago but didn’t pursue it because it seemed way too confusing to me. A friend on Instagram utilizes it in their home and I asked her for information on WHAT IT WAS exactly. She sent me a YouTube video of Julie’s to watch but I never did. Then I happened across Julie’s book at Barnes & Noble the other day. I’ve been discouraged recently with our language arts curriculum. My almost 9 year old doesn’t read fluently by any means yet and her spelling skills are even worse. That’s ok, I was willing to take things slowly and hopefully she’d get there. She strongly dislikes doing any of her reading and spelling work. She complains and I get it, its not a lot of fun. I thought “we just need to get through this and she’ll get it one day.” So, while feeling discouraged I came across The Brave Writer at the bookstore. Flipping through it it hit me like a bolt of lightning. This is it! I wanted my daughter to LOVE reading and writing and spelling and all the things. I wanted her to love learning and it not be something that she just has to put up with. I’m still learning what Brave Writer is all about and sometimes I feel like giving up and just keeping on with what we’re doing but I have to remind myself that while I want her to be a good speller, reader and writer, that if it costs her losing a love for learning, then it isn’t worth it. So thank you for an excellent explanation of what Brave Writer is all about. Thank you so much for this review! I’m mulling over curriculum for this next year and this was extremely helpful. so glad you found it helpful! 🙂 Any other questions, feel free to ask!